New York, NY general and cosmetic dentist Dr. Frederick Solomon can help you determine if dental implants are an appropriate course of treatment for you. Surgically anchored into your jawbone, a dental implant creates a strong foundation for restorations like a porcelain crown. If you have teeth that are missing from decay, injury, or gum disease but have overall good oral health and adequate jawbone mass, dental implants could be a real option for you. Dental implants are generally discussed with a patient when a crown or bridge cannot be placed, or when the patient requests a longer-lasting restoration. During a dental implant consultation, Dr. Solomon will assess the health of your teeth, gums, and jawbone in order to determine if a dental implant is a right option. 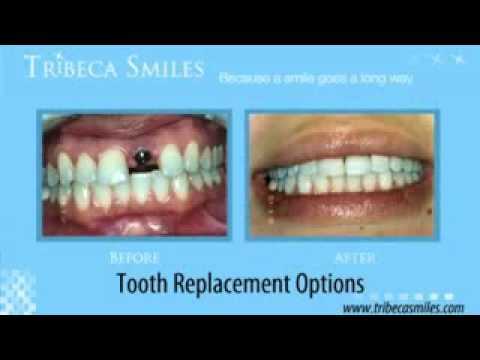 Our dental team at Tribeca Smiles will answer all your questions regarding this in-depth procedure during this appointment as well. As mentioned above, if you have good overall dental health, missing teeth, and an appropriate amount of jawbone, you may be a suitable implant candidate. You need to have these prerequisites as dental implants are deeply anchored into the gum tissue and foundational bone in your jaw. If your jaw does not have enough bone density as is, there are special procedures to help build up the bone to a sufficient level, such as bone grafting. If you are pregnant, a heavy smoker, abuse drugs or alcohol, have had recent radiation treatments to your jaw, or grind your teeth, other options should be considered. During dental implant placement, a titanium post is surgically positioned into the jawbone directly beneath the gum. This allows the tooth to be mounted on top of it. Depending on what is required to prepare your jaws, such as a sinus lift or bone grafts, the healing process may take months before the final stages can be completed. Once the post is implanted, osseointegration occurs where the jawbone becomes one with the implant. This fusion can take many months, but it is vital to establish a solid bed for the post and restoration. After this, another attachment called an abutment is installed on top of the post. Every patient has specific steps to go through to complete their implant placements, and some of the follow-up procedures may be different. Maintaining close contact with Dr. Solomon and his staff will help clarify exactly what you need to do to optimize the results of your implant surgery and minimize complications. You can expect to have temporary swelling in your gums and face, bruising, a slight discomfort at the treatment site, and some minor bleeding. Dr. Solomon will let you know how much of this is normal and at what level you need to alert him. He may also prescribe pain medication and antibiotics as the stitches dissolve and pain subsides. Implants are a major decision. Dr. Solomon can walk you through the process from surgery to the final restoration placement. If you would like to learn more about dental implants or would like to make an appointment for a consultation, please call or sign up online today.